From the festival site, a remote farm that quite literally sits atop a mountain, you’re overlooking some of the most beautiful scenery in Wales. Not far is Marine Colliery, the deep mine that employed thousands in the area and finally closed in 1989. The nearby Ebbw Vale steelworks, which inspired the festival’s name, cast its last steel in 1978 and was finally wound down in 2002. It’s a common tale in these parts – heavy industry has been replaced by light, but the region still bears the scars of the UK’s slow industrial decline. 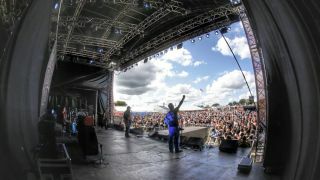 All of which makes the Steelhouse Festival one of the more unlikely and inspiring underdog stories of recent times. Saxon, Magnum, Europe, Black Star Riders and UFO have all graced the mountain top over the years. The valleys have always been heartland country for rock, yet of the 5000-capacity crowd, just 40 per cent come from the local area. This self-styled ‘Welsh International Classic Rock Festival’ attracts people from across the UK and further afield – Finland, Japan, last year one huge Dee Snider fan flew in from Australia to watch him headline. Rhead and co-organiser Mikey Evans grew up just a mile from the site, in the town of Ebbw Vale. Rhead has a background in events management while Evans was Tigertailz’s tour manager for five years. But when it came to organising the first festival back in 2011, they both knew zip. It sprang from their monthly club night at Ebbw Vale Rugby Club, which started in 2010, with the aim of offering the significant local rock audience an authentic rock club experience without driving the 30 miles to Cardiff. Rhead procured a proper stage, PA and lighting rig and hired 4th Street Traffic and The Tom Hollister Trio early on. Word spread about the night and it began selling out, and over the next few years Evans, in the role of booker, secured the services of Warrior Soul, Black Spiders, Bernie Marsden, and The Answer. When Rhead conceived of turning the night into a full-on festival he wanted to simply move it to the rugby pitch, but Blaenau Gwent Council refused to consider it, point blank. Another nearby field was, it turned out, reserved as a nesting ground for a pair of rare lapwing birds, so those plans were refused too. Ultimately Rhead was pointed in the direction of private land owner Hywel Dukes. He met him on his Hafod-Y-Dafal Farm, and within half an hour Dukes gave Rhead the go-ahead to use his farm, and the bureaucracy truly began. That crew – dubbed the ‘Steelhouse Family’ – are an extraordinary and crucial part of this story. Coming mainly from the local community, this 50-strong army of volunteers head up to the farm weeks in advance to get the dirty work done – digging trenches for powers cables, erecting fencing, placing toilets and showers. Throughout the weekend they’ll wrangle the artists from airport to hotel to site. They’ll marshal, man the box office and the car park, then return the field to its previous condition after the crowds have headed back down the mountain side. One year, one of them was sent on an urgent mission to source a power adaptor for a band’s German tour bus so it could plug into the site generator. They finally finding returned, hours later, having sourced this arcane bit of kit on the other side of the Severn Bridge, in Bristol. With The Darkness and Thunder heading for the mountain this year (insert your own Welsh weather joke here), ticket sales are looking healthy. The Steelhouse Festival runs from July 22 to July 24. For tickets and more info go to steelhousefestival.com.